PanCareLIFE researchers from EMC and PMC have published ‘Socio-demographic impact of platinum-induced ototoxicity in long-term survivors of childhood cancer’ (Curr Pediatr Res 2017; 21 (3): 470-479). You can read the full open access publication here. Objective: Childhood cancer survivors (CCS) treated with platinum-based chemotherapy are at risk of treatment-induced ototoxicity. To date, there is limited knowledge on the effect of ototoxicity on socio-demographic factors, the burden to obtain insurances and psychological distress in CCS. Design: Of the 653 CCS with completed questionnaires, 54 survivors had been treated with platinum. Ototoxicity (Münster score ≥ 2b) data were retrieved from pure-tone audiometry. All survivors completed a questionnaire consisting of the Distress Thermometer (DT), measuring the severity of distress and was recoded to a 0 (no distress)-10 (extreme distress) scale. The Hospital Anxiety and Depression Scale (HADS) was used to study the psychological distress (a score ≥ 15 is indicative for clinically significant distress). Results: Median age at diagnosis was 6.2 years (range: 0.01-17.8) and median follow-up time from end of treatment to questionnaire was 15.6 years (range: 3.2-43.7). There were no differences in attempts to obtain insurances, highest education achievement and (un) employment between platinum-treated survivors and non-platinum treated survivors. Among the 54 platinum-treated CCS, median HADS score of hearing impaired survivors (n=22 (median score: 4.5, range: 0.0-29)) was not significantly different from survivors without ototoxicity (n=32 (median score 5.5, range: 0.0-11, p=0.337)). Similarly, DT scores were not significantly different between survivors with or without ototoxicity (p=0.441). Compared to the 599 non-platinum treated survivors, median HADS and DT scores of platinum-treated survivors were not significantly different. Conclusion: Based on this first, small study, we didn’t find differences between CCS who suffer from platinum-related ototoxicity and survivors without hearing impairment, suggesting that CCS with ototoxicity do not necessarily encounter more socio-demographic challenges and psychological distress than CCS without ototoxicity. 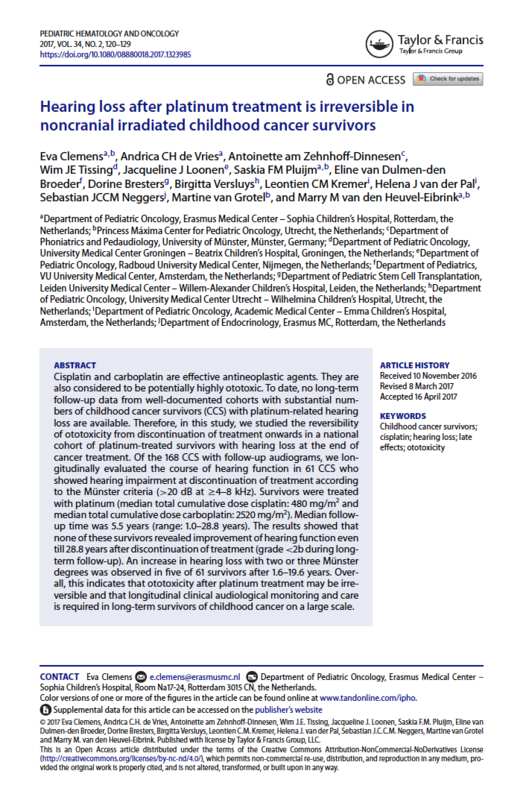 PanCareLIFE researchers at EMC, VUmc, AMC, PMC and UKM have just published a new paper ‘Hearing loss after platinum treatment is irreversible in noncranial irradiated childhood cancer survivors’, funded in part by PanCareLIFE. You can read the full, open access article here. 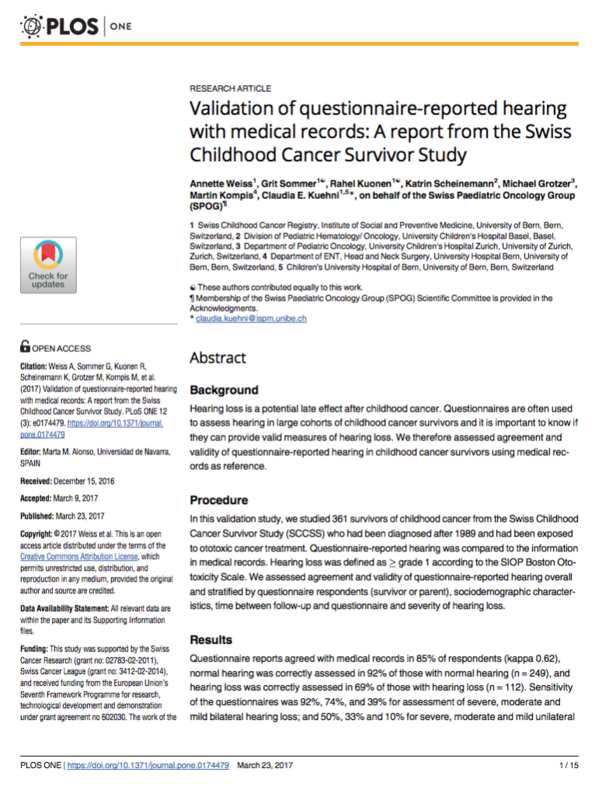 PanCareLIFE researchers at the University of Bern have just published a new paper ‘Validation of questionnaire-reported hearing with medical records: A report from the Swiss Childhood Cancer Survivor Study’, funded in part by PanCareLIFE. You can read the full, open access article here. PanCareLIFE partners at UNIBE have published the results of their work on ‘Long-term auditory complications after childhood cancer: A report from the Swiss Childhood Cancer Survivor Study’ in Pediatric Blood & Cancer (A. Weiss et al. 2017 Feb;64(2):364-373. doi: 10.1002/pbc.26212). Auditory complications are an adverse event of childhood cancer treatment, especially common in children treated with platinum chemotherapy or cranial radiation. Variation between diagnostic childhood cancer groups has rarely been studied, and we do not know if the burden of auditory complications has changed over the last decades. Within the Swiss Childhood Cancer Survivor Study, we sent a questionnaire to all survivors who were diagnosed at age 16 years or less between 1976 and 2005. We compared prevalence of self-reported hearing loss and tinnitus between all diagnostic childhood cancer groups and siblings, used multivariable logistic regression to analyze the effect of treatment-related factors on hearing loss, and compared the cumulative incidence of hearing loss between different periods of cancer diagnosis. Prevalence of self-reported hearing loss was higher in survivors (10%) than in siblings (3%, P < 0.001), and highest in survivors of central nervous system tumors (25%). Significant risk factors were treatment with platinum compounds (carboplatin: odds ratio [OR] 2.4; cisplatin: OR 9.4), cranial radiation (>29 Gy: OR >1.7), or brain surgery (OR 2.2). Children diagnosed in 1986-1995, when platinum compounds came into widespread use, had a significantly higher cumulative incidence of hearing loss than those diagnosed in 1976-1985. In the most recent period, 1996-2005, the risk decreased again, both for patients treated with platinum compounds and with cranial radiation. Our data show that the burden of hearing loss has stabilized in recently treated survivors, suggesting that survivors have benefited from new treatment regimens that use less ototoxic radiation and more carefully dosed platinum compounds. 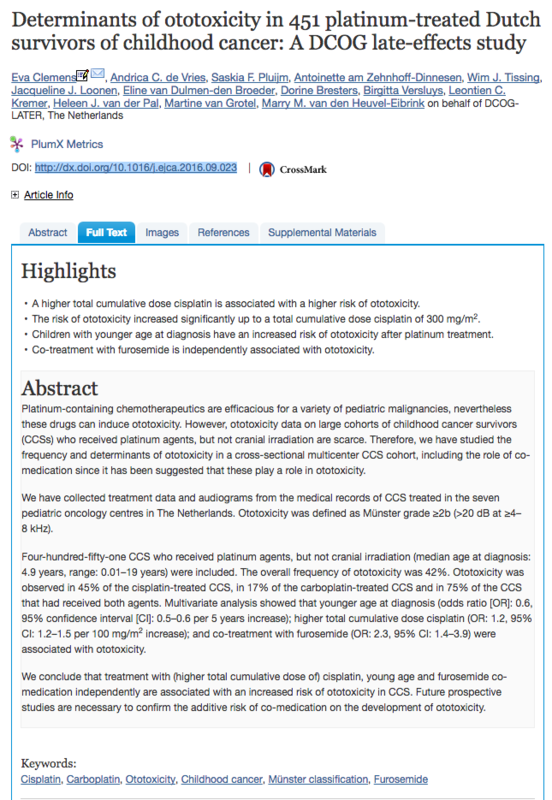 PanCareLIFE researchers at EMC, VUmc, AMC, PMC and UKM have published ‘Determinants of ototoxicity in 451 platinum-treated Dutch survivors of childhood cancer: A DCOG late-effects study’, funded in part by PanCareLIFE. 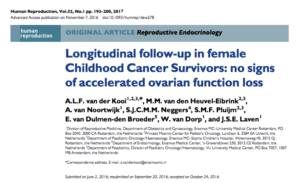 PanCareLIFE researchers from EMC and VUmc have published ‘Longitudinal follow-up in female Childhood Cancer Survivors: no signs of accelerated ovarian function loss’ (Human Reproduction, Vol.32, No.1 pp. 193–200, 2017). STUDY QUESTION: Is the long-term decline of ovarian function, as reflected by a decrease in serum anti-Müllerian hormone (AMH) concentration, accelerated over time in female childhood cancer survivors (CCS) as compared to healthy women of the same age? SUMMARY ANSWER: The median decline of AMH levels in long-term female CCS is not accelerated and similar to that observed in healthy controls. WHAT IS KNOWN ALREADY: Gonadal function is compromised in female CCS treated with chemotherapy and/or radiation therapy. Ovarian function is most compromised in survivors treated with total body irradiation, abdominal or pelvic irradiation, stem cell transplantation or high doses of alkylating agents. STUDY DESIGN SIZE, DURATION: Longitudinal single-centre cohort study in 192 CCS in Rotterdam, The Netherlands, between 2001 and 2014. PARTICIPANTS/MATERIALS, SETTING, METHODS: Serum AMH levels of 192 adult female CCS were assessed, at least five years after cessation of treatment and at a follow-up visit with a median of 3.2 years (range: 2.1–6.0) later and were compared to the age-based P50 of AMH in healthy controls. MAIN RESULTS AND THE ROLE OF CHANCE: Median AMH levels were below the P50 at both visit 1 (−0.59 µg/L) and at visit 2 (−0.22 µg/L). In women with a sustained ovarian function (AMH > 1.0 µg/L), the decline in AMH is similar to that in the normal population (difference in decline per year: −0.07 µg/L (range: −2.86 to 4.92), P = 0.75). None of the treatment modalities was correlated with a signifi- cant acceleration of decline of AMH per year. LIMITATIONS REASONS FOR CAUTION: We selected CCS that visited our late effect outpatient clinic and who had two AMH levels available. It is conceivable that women without any apparent late effects of treatment as well as women with extreme late effects, which might be the ones with the largest impact on ovarian function, could be more likely to be lost to follow-up. However, general characteristics did not differ between the included and excluded patients. WIDER IMPLICATIONS OF THE FINDINGS: While prospective longitudinal research is required to strengthen our findings, they may help physicians to counsel female CCS about their expected reproductive lifespan. 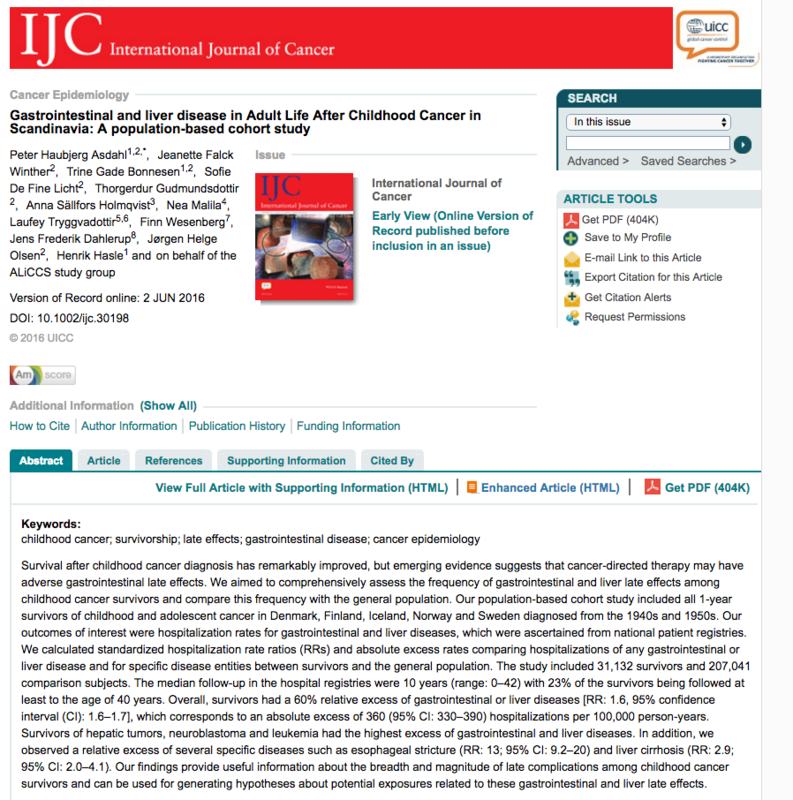 Our Danish colleagues from KB are co-authors on the publication ‘Gastrointestinal and liver disease in Adult Life After Childhood Cancer in Scandinavia: A population-based cohort study’ in the International Journal of Cancer. 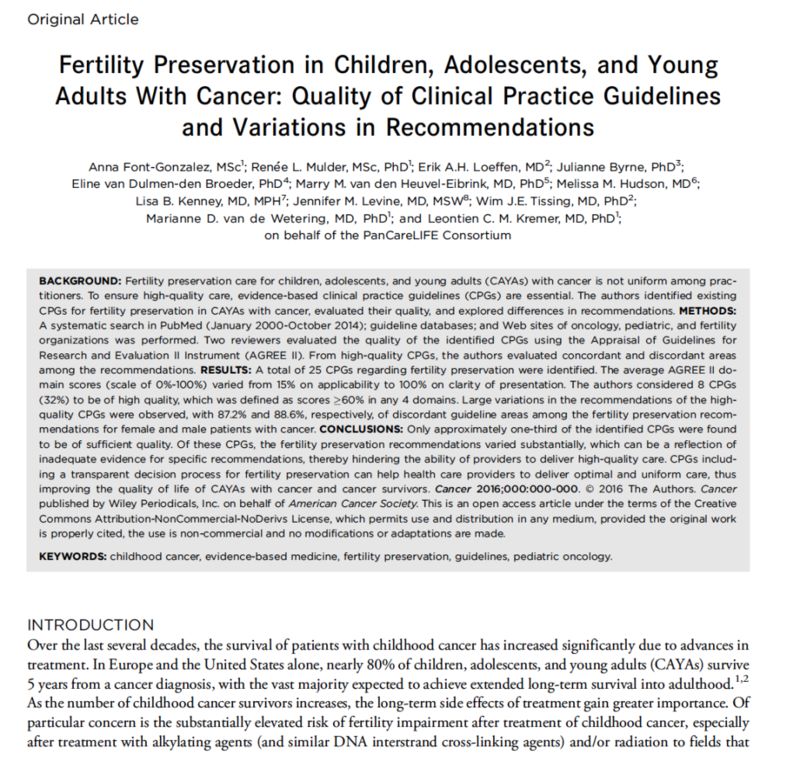 Our publication ‘Fertility preservation in children, adolescents, and young adults with cancer: Quality of clinical practice guidelines and variations in recommendations’ has been published in Cancer (2016 Jul 15;122(14):2216-23. doi: 10.1002/cncr.30047.). The Danish Cancer Society Research Center, project partner in PanCareLIFE, have recently published the first large-scale study of the lifetime risk for autoimmune diseases after childhood cancer, with risk estimates for a broad range of well-defined, medically verified autoimmune diseases. 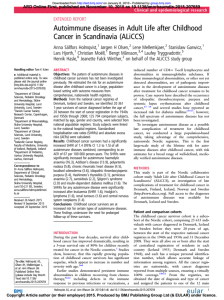 in Annals of the Rheumatic Diseases (Autoimmune diseases in Adult Life after Childhood Cancer in Scandinavia (ALiCCS) – Ann Rheum Dis. 2015 Nov 10. pii: annrheumdis-2015-207659). 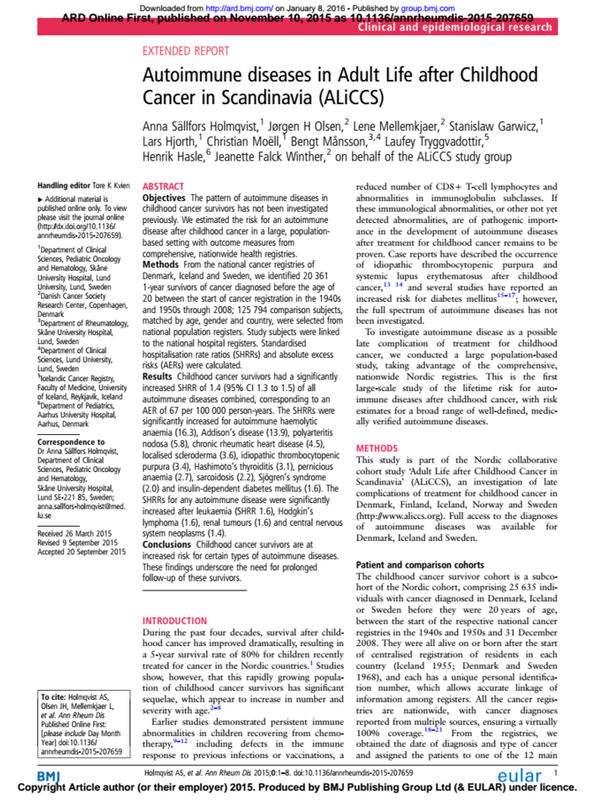 The first author Anna S. Holmqvist, MD, PhD from Lund in Sweden has also been interviewed for a news story in The Lancet Oncology. See our Publications page for other PanCareLIFE related publications. 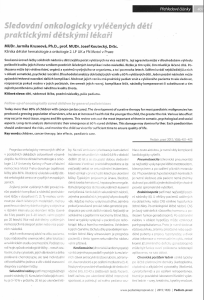 In December 2015, PanCareLIFE researcher Dr. Jarmila Kruseová from FN Motol in Prague published an article ‘Follow-up of oncologically cured children by general practitioners’ in Pediatrie pro praxi, a Czech medical journal.